The Old Mill Holiday Hostel is owned and run by the Carr family. 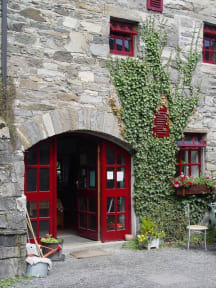 It is set in an old courtyard, just off James Street, giving it a very central location in Westport, Co.Mayo. We hope you enjoy your time at the Old Mill and will return some day. Built around C1780 the building has undergone many changes over the years. It was part of a network of warehouse buildings used as a brewery in the 18th century. It later served as a storehouse, animal shelter and slaughter house, a chicken hatchery and in 1991 was renovated and converted into a low budget holiday hostel. It has been welcoming visitors from all over the world ever since. The Old Mill Holiday Hostel offers clean and comfortable hostel accommodation, where the bedrooms feature the old stone walls and wooden beams refurbished to create a warm relaxing ambience ensuring a calm mind and peaceful sleep. Excellent value for money. We had a 4 bed room and for our group of 4 it was alright. Cleanliness is generally good, unfortunataly some of the other guests left the bathroom quite messy sometimes. Maybe the staff could do an extra quick cleaning round in the morning. 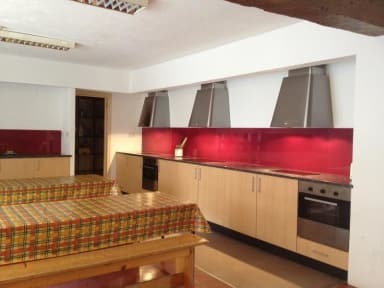 Big kitchen/communal room. We especially enjoyed the homemade bread for breakfast. Great location right in the middle of a lovely small town, Free parking is available only few streets from this hostel. Staff easy to get along with. Das Gebäude an sich sehr schön, aber durch das alte Gemäuer sehr kalt. Duschen hatten keine Temperaturregelung, sodass man sich verbrüht hat. The property itself is very neat and ideally located. The kitchen / common area is clean and spacious and the staff very friendly. Freshly baked bread in the morning! : ) However - according to me the rooms are way too small and don‘t allow much space to store ones luggage. Also the beds are relatively unsteady. Good for a 1 / 2 night stay! Das Hostel ist extrem hellhörig und die Badezimmer sehr dreckig. Es gibt kein richtiges Frühstück.